← The Riddle of the Sphinx? Y’all may recall we got seriously clobbered by a couple of storms last March…seriously damaging pretty much everything we owned. This shut down a lot of project work as we tried to get things dried in and start to repair damage. The progress is woefully…well…nil…but this last weekend I got started on one serious issue; the tower windows at the Old Vic (as opposed to the tower windows at Cupola Art, which were also destroyed in the same storm). The tower windows were all damaged by this storm…shattering one glass, cracking others, and splitting two frames and nearly every sash. This was quite a blow! As an aside, when the this south tower window failed, it blew the glass out of our north dormer window (damaging the sashes). Restoration of these windows simply isn’t in the cards at this time. 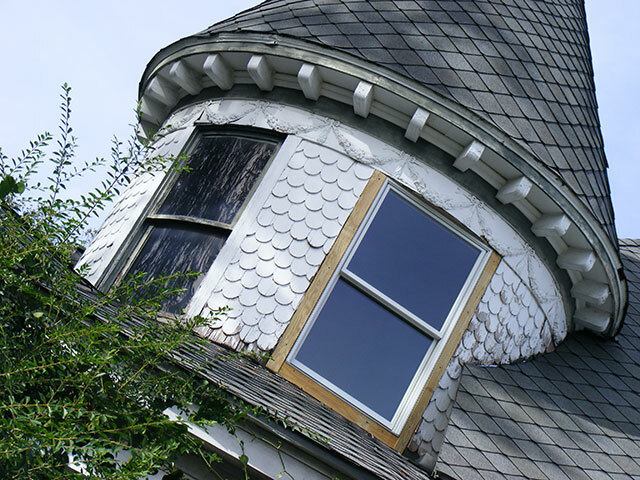 The curved glass, and the required milling of pretty much ALL new parts puts the price tag at restoring JUST those three windows at well over $3000. Since the insurance company determined that the stuff was old and all they would settle for is me “screwing a $39 piece of plexiglass over it”…other options had to be explored. What I did was order three, custom, wooden, double-hung windows to replace them with. I can do all three tower windows for less than I can partially restore ONE of the curved ones. Old house purists will be calling for my head over this, but they had to be fixed. The curved glass was cool and all, but the reality is that they’ve been a problem for the house for well over 100 years. The amount of rot I had to repair just on this one window was just plain scary. See, the sills are nearly flush with the lower roof, allowing water to pile up there and work it’s way in. If the wind was blowing, we could get a literal deluge downstairs in the round room (Entry Parlor). The new windows are 5” shorter, installed at the top, allowing a pronounced sill and correct flashing of the lower roof. I kept the side trim size identical so when painted, we’ll have the same look. So…1st window in the tower replaced. This was a bear. Square peg in round hole…or rather…flat thing in curved wall. Interesting work as I had to replace lots of rot and do “interesting” things involving curves to make everything line up. I like doing interesting things involving curves…though that’s usually things I’m doing to the wife and her curves! Ah well. 100+ year old curved walls are interesting! So…two more to go. They should go faster as I “know” the process and the measurements. I spent a bunch of time on the first one figuring out the best way to, “get it right”. The new window is flashed, mounted, and will never leak again. I still need a caulk job and (obviously) to paint the trim (and the entire rest of…well…*everything*)…but I feel good about this. After this correction, the tower is likely to stay a tower (as opposed to a seriously odd decoration in the entry parlor if it collapsed due to leakages) for the next 100 or so years. This window was #1 because the frame was split, the top glass was shattered, the bottom glass (somebody replaced with plexiglass) was cracked, and BOTH sashes were split/blown in by the storm. I will start on window # 2 next weekend. Just gotta pick which one of the remaining 2…IS #2. Both have cracked glasses. One seriously leaks at the sills/roof, the other, the frame is shattered and it’s simply braced in. One Response to What light through yonder window breaks? Wow! Those original curved windows are incredible!